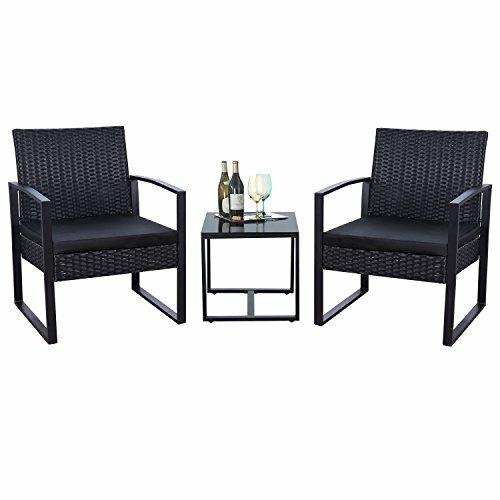 Flamaker is a developing brand in outdoor furniture,we focus on decorating your outdoor living space. While we are concerned about the quality of products, we will also provide superb after-sale services. Make sure that every customer has a very nice shopping experience. There are 1 table|2 armchairs|2 cushions|hardware and instruction.Usually,the goods will be delivered 3 to 6 workdays after shipping. Anti-drop four suckers design makes the tempered glass more stable. It is very easy to take the soft sponge out from the zippered cushiones. Cross-shaped structure improve load-bearing capacity and keep stability. Four rubber protective covers will prevent four glass angles from breaking in transit. No-mar plastic mat( both on chair and table ) Keep them from sliding and scratching. Hand woven PE rattan high quality all weather PE wicker for UV protected and no fading. If you have any questions about this product by Flamaker, contact us by completing and submitting the form below. If you are looking for a specif part number, please include it with your message.